Analytical Applications of 1,10-Phenanthroline and Related Compounds, Volume 32 presents the significance of 1,10-phenanthroline in chemical analysis. This book discusses the varied other uses for 1,10-phenanthroline or of the distinctive advantages afforded by certain related compounds. 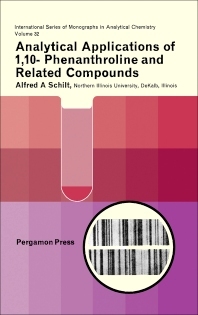 Organized into eight chapters, this volume begins with an overview of the planar structure of 1,10-phenanthroline. This text then examines the relative inertness of phenanthroline towards chemical reaction other than chelation or salt-formation, which is an essential asset in its analytical applications. Other chapters consider the coordination chemistry of phenanthroline and bipyridine in detail. This book discusses as well the metal ions chelated, the features of the chelates, and the influence of substituent groups or other changes in the ligands on the properties of the chelates. The final chapter examines the scientific and commercial uses for 1,10-phenanthroline and related compounds, which have increased in number and importance. This book is a valuable resource for analytical chemists.